Today we have guest, her name is Rachel. When we went down to Mount Ruapehu at the start of October (I said this season by accident), we interviewed some of the staff who were working on the mountain and Rachel was there working this season, she was working in customer services. The first thing I asked her was: Where are you from? Um, I’m from England, in the Midlands, a little town called Tamworth. So this is a midlands accent that’s coming through nice and broad. Kia ora in Stick News today German scientists have developed a self-driving car which passengers can call for a lift. A team at Berlin’s Free University have developed a car called MadeInGermany which they hope will revolutionize the future of driving. Passengers can call the car with an iPad or smartphone. The designers say their invention will make car-sharing more practical and could see the number of cars in Berlin reduced to one-fifth of their current number. And that was Stick News for Monday the 18th of October. 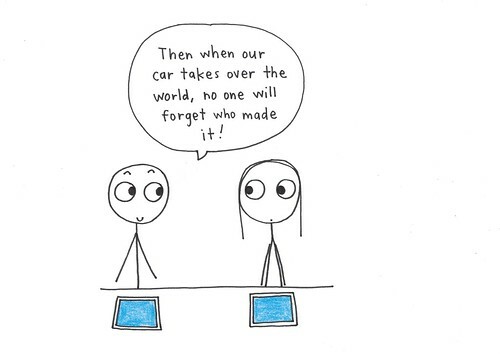 Then when our car takes over the world, no one will forget who made it! MWAHAHA! 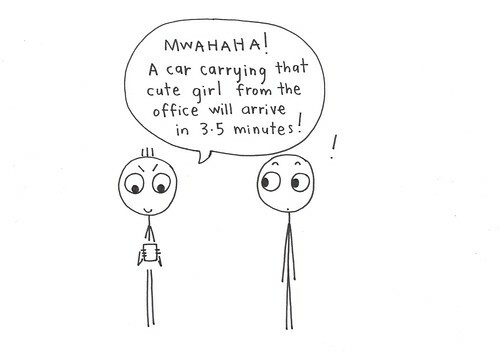 A car carrying that cute girl from the office will arrive in 3.5 minutes! #859 Do you ski or board? Step 2: Read Sarah’s lines and talk to Rachel. Sarah How long have you been in New Zealand? Rachel Um, I arrived in New Zealand the day before the season started, so, like the 20th of June and started work on the 21st. So, four months, something like that. Sarah Did you come here to work on the mountain? Rachel Yeah, I did. Um, I’ve always wanted to do a ski season. And I was in Australia just before here and so I thought, maybe squeeze in a quick ski season in New Zealand first. So, yeah, I applied and two weeks later, here I was. Sarah Do you ski or board? Rachel I do both, quite badly. I started off boarding and, let’s just stay I’m a skier now. So, yeah, I ski. Sarah Where did you learn how to ski? Rachel Um, I learnt here. So, I had a couple of lessons down in Happy Valley and, um, I’m really lucky to have some friends who are instructors. So I had some actual lessons with other people in and then I’ve been out with friends ever since who tell me when to turn, when not to turn, when to stand up straight. So, yeah, I’ve, I’ve learnt to ski this season, it’s been really good. Sarah Are you planning to ski in England when you get back home? Rachel Well, we’ll see. I live really close to an indoor ski slope. So I’m going to master one slope and one slope only which is the indoor Tamworth ski slope. Yay! So that’s where I’ll be doing my skiing in England I should suspect. But I don’t know, we’ll see, I hope to, I hope to carry on. I should do. Sarah What do you like about your job? Rachel It has to be the people, definitely the people - customers and the staff and then the location. You don’t, you don’t often get both, like, in a job. Some people love where they work but don’t necessarily love the job they do. Or some people love going to work and the people they’re with, but maybe they’re in an office and hate the fact they’re in an office. So, you get both here and that’s amazing, definitely. Sarah What were you doing before? Rachel Um, just before coming here to New Zealand I was … I’ve been travelling now for about two years, just under two years. So I’ve been working very hard getting stamps in my passport. So I was in Australia before here and South-East Asia before Australia. So, yeah, this is, this is work, but it feels like …it’s a working holiday, typical working holiday visa, so I’ve been travelling for a little while. Sarah Has anything surprised you about New Zealand English? Sarah People don’t say bro in England? Rachel We don’t … well, unless it’s your brother. But you don’t have to be family to be a bro or a cuz over here. So that’s kind of cool. So, yeah, no, I like it, I like the slang over here, sweet, sweet as, um, it’s all good. So, yeah … it’s positive slang. 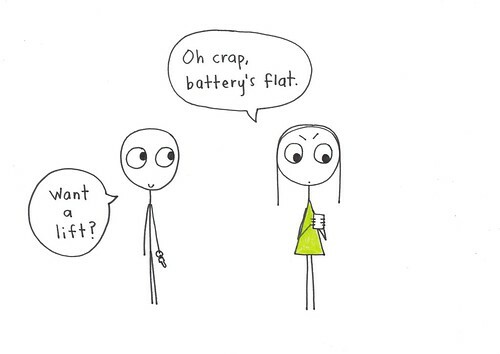 That’s what I get all the time. Even if it’s bad it’s all good.